Would You Try Wearing Latex Hair to Hide Hair Loss? 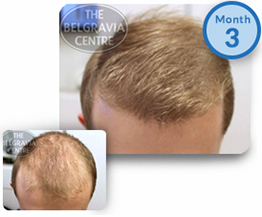 Belgravia Centre Hair Loss Blog > Blog > Hair Loss > Would You Try Wearing Latex Hair to Hide Hair Loss? 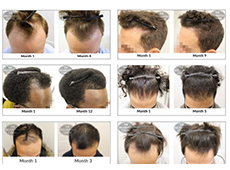 When it comes to dealing with hair loss there are a number of options, but we admit, we haven’t seen anything quite like the latest solution from Paris. During the Spring/Summer 2019 Men’s Fashion Week, top avant garde designer Rei Kawakubo showed her lauded Comme des Garcons Homme Plus collection on models wearing latex hair. Sculpted into a range of different classic men’s hairstyles, these static headpieces provided an unusual, Max Headroom-esque way to cover thinning hair. Whilst it would certainly ensure you never had a hair out of place, this new catwalk hair trend is not everyone’s cup of tea – and there are definitely more discreet ways of handling Male Pattern Baldness. There is the obvious choice of shaving your head, something which suits many men who are comfortable with a bald look, but that others may feel less agreeable. Then there are ways of hiding thinning areas, from wearing wigs or hairpieces, to using hair loss concealer products. These can vary from microfibres – something rumoured to be used by Wayne Rooney – to ‘hair in a can’ coloured sprays. 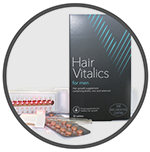 There are clinically-proven, MHRA licensed and FDA approved topical and oral treatment options, as well as a range of key hair growth supporting products available to help men with this genetic condition stabilise their shedding, promote regrowth and assist with preventing baldness on an on-going basis. All without anyone needing to know. Many Belgravia patients tell us that they didn’t tell their friends, family or even their partner, when they started using hair loss treatment. This is usually because either they weren’t sure it was going to work and didn’t want to appear gullible if they didn’t see results, or simply because they didn’t feel it was anyone else’s business. However, as they started noticing results, so too did their circle, often prompting unsolicited comments about how good their hair was looking, followed by questions about what they were doing. UFC athlete Darren Stewart, whose testimonial video you can watch below, was so happy with his hair growth that he posted about it to his Instagram account. He says the reaction he got was incredible, with many people asking what he was using, or just wanting to know if it was actually true. "How Can I Make My Thinning Hair Look Thicker for Parties?"